If you ever want to get a marketing group’s perspective on getting the word out for folks in production agriculture take a few minutes to go to the website of Graphic Arts of Topeka and browse their site and blog. Julie Tucker and Deb Norton work with some fine ranching and farming family operations. Julie and Deb understand production agriculture which is a huge plus when it comes to communicating what your operation is all about. Their blog covers some interesting topics and gives one some great food for thought. Look them up at http://www.gathh.com or look at the bottom of my web pages and you can click on their site. Finally got my own haying done Saturday. What a relief. Taking a cowdog or two along during the days sure spoils them….they really like the AC! They are so smart….they trot over to the tractor and stare at the door and can sure beat you up the steps! Like a lot of the US, it is very hot and our humidity is high. Sure have to take it easy in the mornings with the cattle work. This week is looking like a hot one. I’ll be spending the mornings checking pastures and taking some young cowdogs along. We are mostly staging the spring calves for the weaning process. I want to say thank you to those of you who have contacted me regarding the fundraiser for kids in agriculture related activities. County fairs and state fairs are in full swing now….if you have a chance take a few minutes to watch some 4-H or FFA kids with their showmanship and their livestock projects. Some of these youngsters will go on to be our future production agriculture representatives. The Mid-Missouri Cattleman’s Association held a great fundraiser event to raise money to help sponsor kids in agriculture related activities. My Hangin’ Tree Cowdog puppy and the partnering donations with the puppy brought $650.00. John Clemons from SW Missouri purchased the puppy, the Exclusive puppy and dog food, along with the Frontline Plus and Interceptor for heartworm prevention. Purina Land ‘O Lakes and Quail Valley Veterinary Clinic were the partners for the package deal. Thanks to all the people who attended and participated in the bidding! July 10, 2010 there is a fundraiser at the Miller County Regional Stockyards to raise funds to assist kids interested in participating in agriculture related activities. 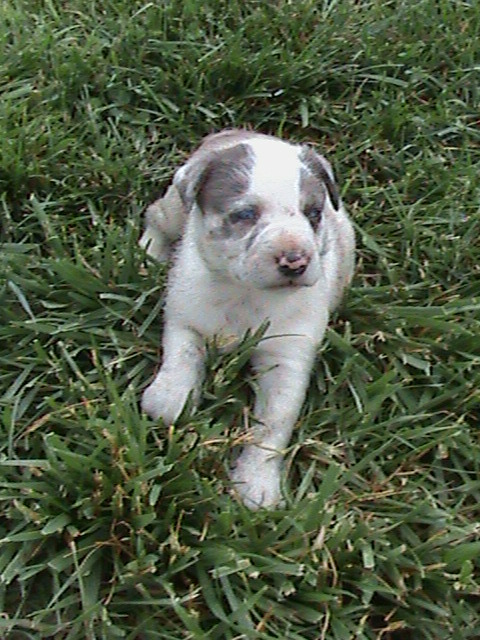 Tammy’s Cowdogs is donating a brown merle female Hangin’ Tree Cowdog puppy. There are two partners in my donation. One is Purina Land ‘O Lakes and they are contributing 3 bags of the newly updated Exclusive puppy and adult chicken and rice dog food. Joe Abbott, the Missouri region beef specialist with Purina LOL is involved with the dog food donation. The second partner to Tammy’s Cowdogs puppy donation is Quail Valley Vet Clinic. Quail Valley provides vet services to my cowdog and cattle operations and they are donating 6 months of Frontline Plus and 6 months of Interceptor. I really appreciate each partner for being a part of my donation and for being involved in the fund raiser for kids interested in agriculture. Anyone interested in the fundraiser can send me an e-mail message. Miller County Regional Stockyard is located a few miles northeast of Eldon, Missouri on U.S. Highway 54. The steak dinner is from 4-6 p.m. and the auction begins at 6:30 p.m.
One thing about all this rain… it does keep the grass going. The spring calves really look good. The flies…nearly all varieties…are pretty bad. So keeping the cows and calves poured is important. Before this last round of rains the past few days we finally got all the pastures sprayed. We used GrazonNext at 1 quart per acre. It does a good job on thistles, ragweed, pigweed, bull nettle, cockle burr, and iron weed…just about all the weeds you can name are checking out. It will certainly be a relief to not have the weeds anymore. We did have to sacrafice some good clover and lespedeza, but that will be easy to re-establish if the right soil conditions are in place in the fall. If we get our haying done (someday!) I hope to head up to Nebraska for a few days to visit some friends and take a few pups along for the ride. We’ll see. We have gotten a great break from the 95+ weather with high humidity and pop-up daily thunderstorms. Got some haying done…what a relief. Had a few mechanical issues to deal with, but rest assured it was good to get back in the field and get more of the hay put up. We have been spending the past few mornings weighing and sorting fall calves for shipping. Today, we shipped some fall calves and then got about 100 spring pairs in and poured them. We got a lot done. I get some questions about mineral. I have used an ADM mineral program for several years. I don’t use the IGR/Altosid/Rabon additive mineral products. My neighbors do not practice horn, stable, or face fly control so feeding the added products in the mineral has never seemed to pay off. I do use a mineral that has “Citri-Stim” and Availa 4. The “Citri-Stim” is a by-product of the citrus industry and is more commonly called citric acid presscake. It binds to E coli and removes it from the cows and calves. I feed the same mineral year throughout the year and get great results. I also use the Red Mintrate Block with Rumensin. You can also get the ADM loose mineral with Citri-Stim and Rumensin and I use it when forage quality and digestibility gets poor. Hope your 4th of July has been a good one. Remember our troops and those who have fought and died in the name of freedom.